We are chiefly engaged in manufacturing, supplying and exporting of Refraction Units (PO-EU) for ophthalmic community. Our Ophthalmic Refraction Unit (PO-EU) is aesthetically designed to buyer’s satisfaction. We can make our goods available in U.A.E, Philippines, Hong Kong, Lebanon, Amman, Portugal, Vietnam, U.S.A., Indonesia and France. A classic piece of workmanship in this ergonomically designed unit being popularly used in the medical and the optical trade. Most modern hospitals, clinics and optical showrooms opt for this product for patients's examination. 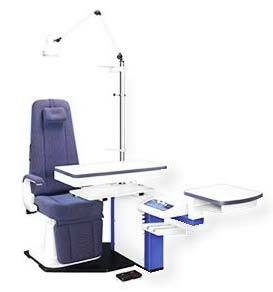 The combination of instruments and equipment's mounted on this equipment limits patients movements, and helps the operator with convenient, speedier mode of examination. The quality of electronic components, raw materials, painting procedures and workmanship set aside this brand from the others. You will be paying for quality, which we assure you.